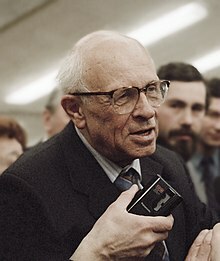 Andrei Sakharov (May 21, 1921 – December 14, 1989) was an eminent Soviet-Russian nuclear physicist, dissident and human rights activist. Sakharov was an advocate of civil liberties and reforms in the Soviet Union and won the Nobel Peace Prize in 1975. Intellectual freedom is essential to human society — freedom to obtain and distribute information, freedom for open-minded and unfearing debate, and freedom from pressure by officialdom and prejudices. The salvation of our en­vironment requires that we overcome our divisions and the pressure of temporary, local interests. We regard as "scientific" a method based on deep analysis of facts, theories, and views, presupposing unprejudiced, unfearing open discussion and conclusions. The complexity and diversity of all the phenomena of modern life, the great possibilities and dangers linked with the scientific-technical revolution and with a number of social tendencies demand precisely such an approach, as has been acknowledged in a number of official statements. The division of mankind threatens it with destruction. Civilization is imperiled by: a universal thermonuclear war, catastrophic hunger for most of mankind, stupefaction from the narcotic of "mass culture," and bureaucratized dogmatism, a spreading of mass myths that put entire peoples and continents under the power of cruel and treacherous demagogues, and destruction or degeneration from the unforeseeable consequences of swift changes in the conditions of life on our planet. In the face of these perils, any action increasing the division of mankind, any preaching of the incompatibility of world ideologies and nations is madness and a crime. Only universal cooperation under conditions of intellec­tual freedom and the lofty moral ideals of socialism and labor, accompanied by the elimination of dogmatism and pressures of the concealed interests of ruling classes, will preserve civilization. The reader will understand that ideological collaboration cannot apply to those fanatical, sectarian, and extremist ideologies that reject all possibility of rapprochement, discussion, and compromise, for example, the ideologies of fascist, racist, militaristic, and Maoist demagogy. Millions of people throughout the world are striving to put an end to poverty. They despise oppression, dogmatism, and demagogy (and their more extreme manifestations — racism, fascism, Stalinism, and Maoism). They believe in progress based on the use, under conditions of social justice and intellectual freedom, of all the positive experience accumulated by mankind. Intellectual freedom is essential to human society — freedom to obtain and distribute information, freedom for open-minded and unfearing debate, and freedom from pressure by officialdom and prejudices. Such a trinity of freedom of thought is the only guarantee against an infection of people by mass myths, which, in the hands of treacherous hypocrites and demagogues, can be transformed into bloody dictatorship. Freedom of thought is the only guarantee of the feasibility of a scientific democratic approach to politics, economy, and culture. But freedom of thought is under a triple threat in modern society—from the deliberate opium of mass culture, from cowardly, egotistic, and philistine ideologies, and from the ossified dogmatism of a bureaucratic oligarchy and its favorite weapon, ideological censorship. Therefore, freedom of thought requires the defense of all thinking and honest people. The worldwide dangers of war, famine, cults of personality, and bureaucracy — these are perils for all of mankind. Recognition by the working class and the intelligentsia of their common interests has been a striking phenomenon of the present day. The most progressive, internationalist, and dedicated element of the intelligentsia is, in essence, part of the working class, and the most advanced, educated, internationalist, and broad-minded part of the working class is part of the intelligentsia. Three technical aspects of thermonuclear weapons have made thermonuclear war a peril to the very existence of humanity. These aspects are: the enormous destructive power of a thermonuclear explosion, the relative cheapness of rocket-thermonuclear weapons, and the practical impos­sibility of an effective defense against a massive rocket-nuclear attack. The technology and tactics of attack have now far surpassed the technology of defense despite the development of highly maneuverable and powerful anti-missiles with nuclear warheads and despite other technical ideas, such as the use of laser beams and so forth. The experience of past wars shows that the first use of a new technical or tactical method of attack is usually highly effective even if a simple antidote can soon be developed. But in a thermonuclear war the first blow may be the decisive one and render null and void years of work and billions spent on creation of an anti-missile system. Fortunately for the stability of the world, the difference between the technical-economic potentials of the Soviet Union and the United States is not so great that one of the sides could undertake a "preventive aggression" without an almost inevitable risk of a destructive retaliatory blow. This situation would not be changed by a broadening of the arms race through the development of anti-missile defenses. A thermonuclear war cannot be considered a continuation of politics by other means (according to the formula of Clausewitz). It would be a means of universal suicide. A complete destruction of cities, industry, transport, and systems of education, a poisoning of fields, water, and air by radioactivity, a physical destruction of the larger part of mankind, poverty, barbarism, a return to savagery, and a genetic degeneracy of the survivors under the impact of radiation, a destruction of the material and information basis of civilization — this is a measure of the peril that threatens the world as a result of the estrangement of the world's two super-powers. Every rational creature, finding itself on the brink of a disaster, first tries to get away from the brink and only then does it think about the satisfaction of its other needs. If mankind is to get away from the brink, it must overcome its divisions. If direct responsibility for Vietnam rests with the United States, in the Middle East direct responsibility rests not with the United States but with the Soviet Union (and with Britain in 1948 and 1956). We cannot here analyze the entire contradictory and tragic history of the events of the last twenty years, in the course of which the Arabs and Israel, along with historically justified actions, carried out reprehensible deeds, often brought about by the actions of external forces. Thus, in 1948, Israel waged a defensive war. But in 1956, the actions of Israel appeared reprehensible. The preventive six-day war in the face of threats of destruction by merciless, numerically vastly superior forces of the Arab coalition could have been justifiable. But the cruelty to refugees and prisoners of war and the striving to settle territorial questions by military means must be condemned. In our opinion, certain changes must be made in the conduct of international affairs, systematically subordinating all concrete aims and local tasks to the basic task of actively preventing an aggravation of the international situation, of actively pursuing and expanding peaceful coexistence to the level of cooperation, of making policy in such a way that its immediate and long-range effects will in no way sharpen international tensions and will not create difficulties for either side that would strengthen the forces of reaction, militarism, nationalism, fascism, and revanchlsm. All peoples have the right to decide their own fate with a free expression of will. This right is guaranteed by international control over observance by all governments of the "Declaration of the Rights of Man." International control presupposes the use of economic sanctions as well as the use of military forces of the United Nations in defense of "the rights of man." International policy does not aim at exploiting local, specific conditions to widen zones of influence and create difficulties for another country. The goal of international policy is to insure universal fulfillment of the "Declaration of the Rights of Man" and to prevent a sharpening of international tensions and a strengthening of militarist and nationalist tendencies. Such a set of principles would in no way be a betrayal of the revolutionary and national liberation struggle, the struggle against reaction and counterrevolution. On the contrary, with the elimination of all doubtful cases, it would be easier to take decisive action in those extreme cases of reaction, racism, and militarism that allow no course other than armed struggle. It is apparently futile only to insist that the more back­ward countries restrict their birth rates. What is needed most of all is economic and technical assistance to these countries. This assistance must be of such scale and generosity that it is unlikely before the estrangement in the world and the egotistical, narrow-minded approach to relations between nations and races are eliminated. The threat of hunger cannot be eliminated without the assistance of the developed countries, and this requires significant changes in their foreign and domestic policies. Government policy, legislation on the family and marriage, and propaganda should not encourage an increase in the birth rates of advanced countries while demanding that it be curtailed in underdeveloped countries that are receiving assistance. Such a two-faced game would produce nothing but bitterness and nationalism. I want to emphasize that the question of regulating birth rates is highly complex and that any standardized, dogmatic solution "for all time and all peoples" would be wrong. We live in a swiftly changing world. Industrial and water-engineering projects, cutting of forests, plowing up of virgin lands, the use of poisonous chemicals — all such ac­tivity is changing the face of the earth, our "habitat." Scientific study of all the interrelationships in nature and the consequences of our interference clearly lags be­hind the changes. Large amounts of harmful wastes of industry and transport are being dumped into the air and water, including cancer-inducing substances. Will the safe limit be passed everywhere, as has already happened in a number of places? The problem of geohygiene (earth hygiene) is highly complex and closely tied to economic and social problems. This problem can therefore not be solved on a national and especially not on a local basis. The salvation of our en­vironment requires that we overcome our divisions and the pressure of temporary, local interests. Otherwise, the Soviet Union will poison the United States with its wastes and vice versa. An extreme reflection of the dangers confronting modern social development is the growth of racism, nationalism, and militarism and, in particular, the rise of demagogic, hypocritical, and monstrously cruel dictatorial police regimes. Foremost are the regimes of Stalin, Hitler, and Mao Tse-tung, and a number of extremely reactionary regimes in smaller countries, such as Spain, Portugal, South Africa, Greece, Albania, Haiti, and other Latin American countries. Fascism lasted twelve years in Germany. Stalinism lasted twice as long in the Soviet Union. There are many common features but also certain differences. Stalinism exhibited a much more subtle kind of hypocrisy and demagogy, with reliance not on an openly cannibalistic program like Hitler's but on a progressive, scientific, and popular socialist ideology. This served as a convenient screen for deceiving the working class, for weakening the vigilance of the intellectuals and other rivals in the struggle for power, with the treacherous and sudden use of the machinery of torture, execution, and informants, intimidating and making fools of millions of people, the majority of whom were neither cowards nor fools. As a consequence of this "specific fea­ture" of Stalinism, it was the Soviet people, its most active, talented, and honest representatives, who suffered the most terrible blow. The anti-people's regime of Stalin remained equally cruel and at the same time dogmatically narrow and blind in its cruelty. The killing of military and engineering officials before the war, the blind faith in the "reasonableness" of the colleague in crime, Hitler, and the other reasons for the national tragedy of 1941 have been well described … Stalinist dogmatism and isolation from real life was demonstrated particularly in the countryside, in the policy of unlimited exploitation and the predatory forced deliver­ies at "symbolic" prices, in almost serflike enslavement of the peasantry, the depriving of peasants of the simplest means of mechanization, and the appointment of collective-farm chairmen on the basis of their cunning and obsequiousness. The results are evident — a profound and hard-to-correct destruction of the economy and way of life in the countryside, which, by the law of interconnected vessels, damaged industry as well. The inhuman character of Stalinism was demonstrated by the repressions of prisoners of war who survived fascist camps and then were thrown into Stalinist camps, the anti-worker "decrees," the criminal exile of entire peoples condemned to slow death, the unenlightened zoological kind of anti-Semitism that was characteristic of Stalin bureaucracy and the NKVD (and Stalin personally), the Ukrainophobia characteristic of Stalin, and the draconian laws for the protection of socialist property (five years' imprisonment for stealing some grain from the fields and so forth) that served mainly as a means of fulfilling the demands of the "slave market." The author is quite aware of the monstrous relations in human and international affairs brought forth by the egotistical principle of capital when it is not under pressure from socialist and progressive forces. He also thinks, however, that progressives in the West understand this better than he does and are waging a struggle against these manifestations. The author is concentrating his attention on what is before his eyes and on what is obstructing, from his point of view, a worldwide overcoming of estrangement, obstructing the struggle for democracy, social progress, and intellectual freedom. Our country has started on the path of cleansing away the foulness of Stalinism. "We are squeezing the slave out of ourselves drop by drop" (an expression of Anton Chekhov). We are learning to express our opinions, without taking the lead from the bosses and without fearing for our lives. From 1936 to 1939 more than 1.2 million Party members, half of the total membership, were arrested. Only fifty thousand regained freedom; the others were tortured during interrogation or were shot (six hundred thousand) or died in camps. Only in isolated cases were the rehabilitated allowed to assume responsible posts; even fewer were permitted to take part in the investigation of crimes of which they had been witnesses or victims. We are often told lately not to "rub salt into wounds." This is usually being said by people who suffered no wounds. Actually only the most meticulous analysis of the past and of its consequences will now enable us to wash off the blood and dirt that befouled our banner. It is imperative that we restrict in every possible way the influence of neo-Stalinists in our political life. In recent years, demagogy, violence, cruelty, and vileness have seized a great country embarked on the path of socialist development. I refer, of course, to China. It is impossible without horror and pain to read about the mass contagion of anti-humanism being spread by "the great helmsman" and his accomplices, about the Red Guards who, according to the Chinese radio, "jumped with joy" during public executions of "ideological enemies" of Chairman Mao. The idiocy of the cult of personality has assumed in China monstrous, grotesquely tragicomic forms, carrying to the point of absurdity many of the traits of Stalinism and Hitlerism. But this absurdity has proved effective in making fools of tens of millions of people and in destroying and humiliating millions of intelligent citizens. Actually the crimes of the Maoists against human rights have gone much too far, and the Chinese people are now in much greater need of help from the world's democratic forces to defend their rights than in need of the unity of the world's Communist forces, in the Maoist sense, for the purpose of combating the so-called imperialist peril somewhere in Africa or in Latin America or in the Middle East. Nothing threatens freedom of the personality and the meaning of life like war, poverty, terror. But there are also indirect and only slightly more remote dangers. One of these is the stupefaction of man (the "gray mass," to use the cynical term of bourgeois prognosticators) by mass culture with its intentional or commercially motivated lowering of intellectual level and content, with its stress on entertainment or utilitarianism, and with its carefully protective censorship. This is a threat to the independence and worth of the human personality, a threat to the meaning of human life. A system of education under government control, separation of school and church, universal free education — all these are great achievements of social progress. But everything has a reverse side. In this case it is excessive standardization, extending to the teaching process itself, to the curriculum, especially in literature, history, civics, geography, and to the system of examinations. One cannot but see a danger in excessive reference to authority and in the limitation of discussion and intellectual boldness at an age when personal convictions are beginning to be formed. In the old China, the systems of examinations for official positions led to mental stagnation and to the canonizing of the reactionary aspects of Confucianism. It is highly undesirable to have anything like that in a modern society. Man must not be turned into a chicken or a rat as in the well-known experiments in which elation is induced electrically through electrodes inserted into the brain. Related to this is the question of the ever-increasing use of tranquilizers and anti-depressants, legal and illegal narcotics, and so forth. Marx once wrote that the illusion that the "bosses know everything best" and "only the higher circles familiar with the official nature of things can pass judgment" was held by officials who equate the public weal with governmental authority. Both Marx and Lenin always stressed the viciousness of a bureaucratic system as the opposite of a democratic system. Lenin used to say that every cook should learn how to govern. Is it not highly disgraceful and dangerous to make increasingly frequent attempts, either directly or indirectly (through silence), to publicly rehabilitate Stalin, his associates, and his policy, his pseudosocialism of terroristic bu­reaucracy, a socialism of hypocrisy and ostentatious growth that was at best a quantitative and one-sided growth involving the loss of many qualitative features? Without socialism, bourgeois practices and the egotistical principle of private ownership gave rise to the "people of the abyss" described by Jack London and earlier by Engels. Only the competition with socialism and the pressure of the working class made possible the social progress of the twentieth century and, all the more, will insure the now inevitable process of rapprochement of the two systems. It took socialism to raise the meaning of labor to the heights of a moral feat. Before the advent of socialism, national egotism gave rise to colonial oppression, nationalism, and racism. By now it has become clear that victory is on the side of the humanistic, international approach. The capitalist world could not help giving birth to the socialist, but now the socialist world should not seek to destroy by force the ground from which it grew. Under the present conditions this would be tantamount to the suicide of mankind. Socialism should ennoble that ground by its example and other indirect forms of pressure and then merge with it. Bertrand Russell once told a peace congress in Moscow that "the world will be saved from thermonuclear annihilation if the leaders of each of the two systems prefer complete victory of the other system to a thermonuclear war." (I am quoting from memory.) It seems to me that such a solution would be acceptable to the majority of people in any country, whether capitalist or socialist. I consider that the leaders of the capitalist and socialist systems by the very nature of things will gradually be forced to adopt the point of view of the majority of mankind. Intellectual freedom of society will facilitate and smooth the way for this trend toward patience, flexibility, and a security from dogmatism, fear, and adventurism. All mankind, including its best-organized and most active forces, the working class and the intelligentsia, is interested in freedom and security. The strategy of peaceful coexistence and collaboration must be deepened in every way. Scientific methods and principles of international policy will have to be worked out, based on scientific prediction of the immediate and more distant consequences. The initiative must be seized in working out a broad program of struggle against hunger. A law on press and information must be drafted, widely discussed, and adopted, with the aim not only of ending irresponsible and irrational censorship, but also of encouraging self-study in our society, fearless discussion, and the search for truth. The law must provide for the material resources of freedom of thought. All anti-constitutional laws and decrees violating human rights must be abrogated. I foresee a universal information system (UIS), which will give everyone access at any given moment to the contents of any book that has ever been published or any magazine or any fact. The UIS will have individual miniature-computer terminals, central control points for the flood of information, and communication channels incorporating thousands of artificial communications from satellites, cables, and laser lines. Even the partial realization of the UIS will profoundly affect every person, his leisure activities, and his intellectual and artistic development. ... But the true historic role of the UIS will be to break down the barriers to the exchange of information among countries and people. Thousands of years ago, tribes of human beings suffered great privations in the struggle to survive. In this struggle it was important not only to be able to handle a club, but also to possess the ability to think reasonably, to take care of the knowledge and experience garnered by the tribe, and to develop the links that would provide cooperation with other tribes. Today the entire human race is faced with a similar test. In infinite space many civilizations are bound to exist, among them civilizations that are also wiser and more "successful" than ours. I support the cosmological hypothesis which states that the development of the universe is repeated in its basic features an infinite number of times. In accordance with this, other civilizations, including more "successful" ones, should exist an infinite number of times on the "preceding" and the "following" pages of the Book of the Universe. Yet this should not minimize our sacred endeavors in this world of ours, where, like faint glimmers of light in the dark, we have emerged for a moment from the nothingness of dark unconsciousness of material existence. We must make good the demands of reason and create a life worthy of ourselves and of the goals we only dimly perceive. Nobel Peace Prize Speech (1975). Read by his wife Yelena Bonner. Freedom of conscience, the existence of an informed public opinion, a system of education of a pluralist nature, freedom of the press, and access to other sources of information, all these are in very short supply in the socialist countries. You all know, even better than I do, that children, e.g. from Denmark, can get on their bicycles and cycle off to the Adriatic. No one would ever think of suggesting that they were "teenage spies". But Soviet children are not allowed to do this! Freedom to travel, freedom to choose where one wishes to work and live, these are still violated in the case of millions of kolkhoz workers, and in the case of hundreds of thousands of Crimean Tartars, who thirty years ago were cruelly and brutally deported from the Crimea and who to this day have been denied the right to return to the land of their fathers. The Helsinki Treaty confirms yet again the principle of freedom of conscience. However, a stern and relentless struggle will have to be carried on if the contents of this treaty are to be given reality. In the Soviet Union today many thousands of people are persecuted because of their convictions, both by judicial and by non-judicial organs, for the sake of their religious beliefs and for their desire to bring their children up in the spirit of religion, for reading and disseminating - often only to a few acquaintances - literature which is unwelcome to the State, but which in accordance with ordinary democratic practice is absolutely legitimate, e.g. religious literature, and for attempts to leave the country. On the moral plane the persecution of persons who have defended other victims of unjust treatment, who have worked to publish and in particular to distribute information regarding the persecution and trials of persons with deviant opinions, and of conditions in places of internment, is particularly important. It is unbearable to consider that at this very moment that we are gathered together in this hall on this festive occasion, hundreds and thousands of prisoners of conscience are suffering from undernourishment, as the result of year-long hunger, and of an almost total lack of proteins and vitamins in their daily food, of a shortage of medicines (there is a ban on the sending of vitamins and medicines to internees), and of over-exertion. They shiver with cold, damp, and exhaustion in ill-lit dungeons, where they are forced to wage a ceaseless struggle for their human dignity and their conviction against the "indoctrination machine", in fact against the very destruction of their souls. But what about the sufferings of the innocent? Worst of all is the hell that exists in the special psychiatric clinics in Dnieperopetrovsk, Sytshevk, Blagoveshensk, Kazan, Chernakovsk, Oriol, Leningrad, Tashkent, … . I grew up in a large communal apartment where most of the rooms were occupied by my family and relations and only a few by outsiders. The house was pervaded by a strong traditional family spirit — a vital enthusiasm for work and respect for professional competence. Within the family we provided one another with mutual support, just as we shared a love of literature and science. It is the social issues which unremittingly demand that I make a responsible personal effort and which also lay increasing claims on my physical and mental powers. For me, the moral difficulties lie in the continual pressure brought to bear on my friends and immediate family, pressure which is not directed against me personally but which at the same time is all around me. I have written about this on many occasions but, sad to report, all that I said before applies equally today. I am no professional politician — which is perhaps why I am continually obsessed by the question as to the purpose served by the work done by my friends and myself, as well as its final result. I tend to believe that only moral criteria, coupled with mental objectivity, can serve as a sort of compass in the cross-currents of these complex problems. Faces of Resistance in the USSR, The Andrei Sakharov Archives Homepage (Archived webpage). Brandeis University. Archived from the original on 2003-01-20. Retrieved on April 17, 2006. Moss, Walter G. (August 2009). The Wisdom of Andrei Sakharov. Gewertz, Ken. "Bonner points to still-powerful KGB Former Soviet dissidents say that present-day Russia shows little improvement over dark days of old regime". Harvard News Office. This page was last edited on 5 April 2019, at 21:14.